← Golden Rice, soon. Or not. Why we eat so much meat is a question that keeps coming up, as well it should. The real reason is that…. well to cut to the chase, there are a lot of reasons, big and small, general and specific. I just read a small but interesting one this morning from dieter-blogger Jane McClaren (responding to Mark Bittman’s “Hooked on Meat“): it’s because of agricultural distancing. When stores have tasteless long-traveled vegetables, “Why not go next door and grab a salty, fatty burger in a bag? It’s so much easier.” I’m not sure how much that really explains, but I’ll grant that the convenience factor is in the top 10 drivers of meat consumption, at least in those parts of the world blessed with McD’s and Ponderosas. But the main reason we have such convenient beef outlets in the first place is that we had artificially cheap beef, because we had artificially cheap grain. It all started with the flood of nitrogen in the US following WW2. Most nitrogen in nature needs to be “fixed” before plants can use it, but some concentrated forms of fixed nitrogen are both fertilizing and explosive. Timothy McVeigh, you may remember, blew up the Murrah building with a truckload of fertilizer. The fertilizer age was driven by nitrogen, but use of industrial nitrogen meant the farmer minimally needed phosphorus and potassium as well. A lot has been written on the "NPK" mentality; I think Michael Pollan does a particularly good job with it in Omnivore's Dilemma. The flood of fertilizer and spread of fertilizer-intensive grain — especially corn — caused a sea change in the ecology of the grain field and then a sea change in the structure of agriculture. In the field, farmers could now plant corn plants much closer together to capitalize on the highly concentrated fertilizer. But all those extra roots required extra water, and the moist fertile soil and dense plants were a heaven for weeds and insects. 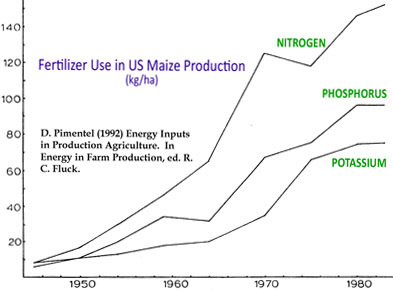 So, a short history of agricultural industrialization in the US: tractors in the 1920s, hybrid seeds in the 1930-40s, and then after 1950 the trifecta of intensive fertilizer, irrigation, and pesticides. An Illinois corn field. My colleague, the renowned ethnobotanist Gayle Fritz, point to where the plants are literally planted right on top of each other. And it came to pass that corn yields (output per acre) boomed. And that corn prices slumped. Here’s a graph I just made; again look at what happens after 1950. Click to see the graph. Data are from the USDA's National Agricultural Statistics Service. The change in grain (especially corn) ecology led to the splitting of crop and livestock production and laid the foundation for factory farming, highlighted by the hyperproduction of maize and maize-feeding cows (and other animals) in CAFO’s. Of course cows are ridiculously inefficient at turning grain into meat. The “feeding efficiencies” of stock animals change through time, but in 1975 when US beef consumption was at its peak, it was taking 14 kg. of corn to make 1 kg of beef. For comparison, the ratio for pork was 6:1, and for chickens 3:1. But that wasn’t a problem, it was an opportunity; after all, the system was in effect looking for ways to burn up the surplus corn. Americans had eaten beef before, but the beef boom began in the 1950s — a story that has been told elsewhere. The underlying cause was a surplus of fertilizer being turned into a surplus of grain being turned into a surplus of beef. So when we hear that the worlds needs to boost food production by so much, not just because of population growth but because people in developing countries want to eat more meat, it’s a bit convoluted. We eat this much beef, and have these institutions to provide it so conveniently, because we overproduce grain. Notes. If you’re interested in “distancing” and “fresh” foods, you owe it to yourself to read Suzanne Freidberg’s wonderful book Fresh. On meat eating as “progress” throughout history I recommend Warren Belasco’s Meals to Come: A history of the future of food. A fascinating article on the politics and ecology of splitting up crop and livestock production is Foster & Magdoff’s “Liebig, Marx, and the depletion of soil fertility: relevance for today’s agriculture” in Hungry for Profit. The figures on feeding efficiencies are from Smil (2002) “Eating meat: Evolution, patterns, and consequences,” Population and Development Review 28:599-639. This entry was posted in Agriculture, Food and tagged beef, distancing, feedlots, fertilizer, food, overproduction. Bookmark the permalink. Very interesting. But just how does one “breed grains with a sweet tooth”? 1) The main way is backcrossing. 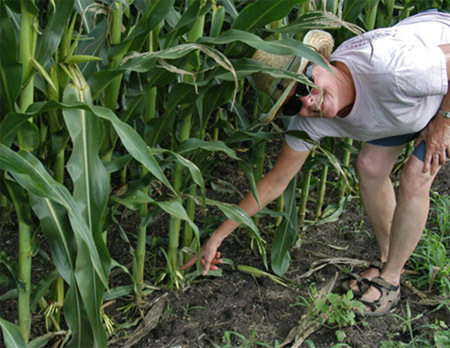 Say you have type A corn that’s great except it’s vulnerable to a disease, and type B that’s resistant to the disease. You cross them then look through all the different offspring for plants that still have most of the A traits but they also have the resistance from B. You cross those offspring back with the A parent, then look for the same thing. You keep doing this until you have corn that has most or all of the A traits but also has the resistance trait from B. 2) You breed for plants that put more energy into producing seeds and less into the stalk. If you planted pre-war seeds and dosed them with these concentrated industrial fertilizers, they stalks would grow too much and instead of making lots of grain they would “lodge” (fall over).